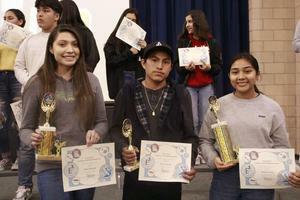 Bassett High School 10th-graders Denise Luiviano and Jade Loera received a first-place award for their project, “Acid Effects on Brine Shrimp,” which tested the reaction of brine shrimp to amounts of vinegar. TOP: Bassett High School students Alexa Quesada (second place), Alfonso Sontay (third place) and Denise Luiviano received awards for their science fair projects at Bassett Unified’s fourth annual District Science Fair on Feb. 21 at Torch Middle School’s Watanabe Center. 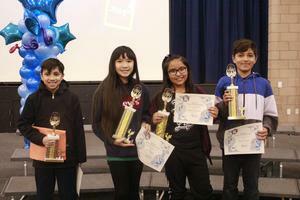 BOTTOM: Edgewood Academy fifth-grade students Gabriel Carmona, Alexandra Hernandez and Anh'thy Nguyen, receive awards along with Don Julian fifth-grader and second place winner Jeremy Galvan at Bassett Unified’s fourth annual District Science Fair on Feb. 21 at Torch Middle School’s Watanabe Center.